Oh yeah! Timba from Texas... Austin, Texas to be exact. 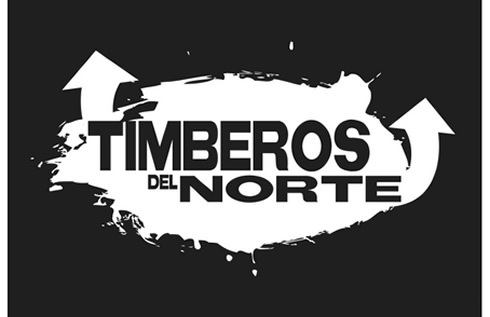 The first and self-titled album by TIMBEROS DEL NORTE was named one of the Top 10 Austin Releases (see below). Grammy-winning trombonist / arranger Raul “Ralo” Vallejo and pianist / producer Paul “Pauly” Matthews spearhead this 10-piece outfit featuring multi-layered vocals and horns in an impressive and enticing 12-song collection of heavily rhythmic Cuban jazz and pop. Click on their album cover below to visit their website. Leslie Cartaya sings on the set of the upcoming new video from Afro-Cuban Funk Band PALO! 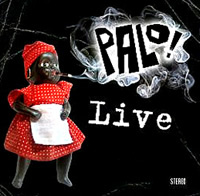 A live show is where PALO! shines brightest; their album “PALO! Live” was recorded at their 10-year anniversary show, and the results have been impressive. 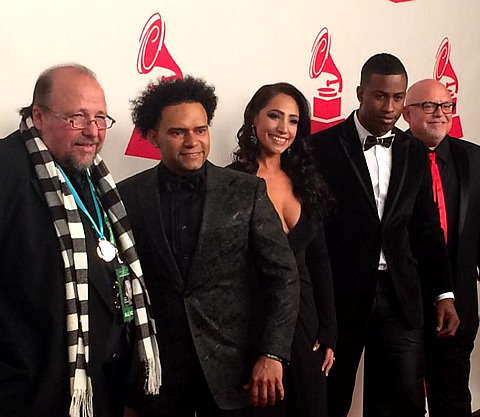 Prior to getting the 2015 Grammy nod, the record was nominated for a Latin Grammy as Best Contemporary Tropical Album of 2014. 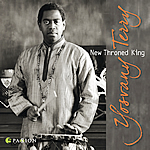 “Our music, steeped in the traditions of Afro-Cuban music, funk, and jazz, thrives in a live setting. We leave room for improvisation and spontaneity, while striving to hit a deep, danceable groove.” After hearing PALO!’s catchy songs and the spectacular vocals of Leslie Cartaya, you will understand why the music industry has recognized this group with two nominations. Tremendo PALO! -- Afro-Cuban Funk group PALO! 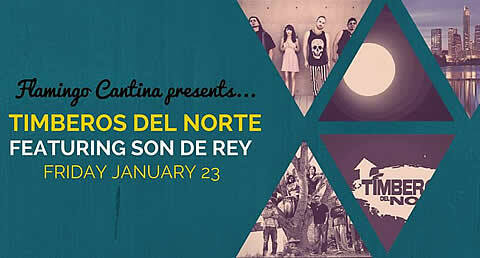 is buzzing hard after their LatinGrammy® nomination. The group -- singer Leslie Cartaya, Raymer Olande, Philbert Armenteros, pianist Steve Roitstein and saxophonist Ed Calle -- got a nomination for their live record Palo! Live. 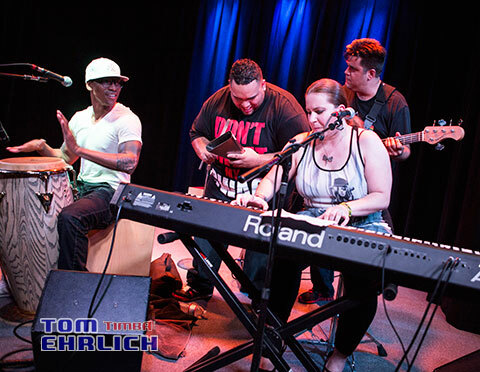 The group’s unique, danceable sound blends the allure of Cuban music with funky beats and jazzy improvisation. You can check out Bill Tilford's review of the record (click) here. 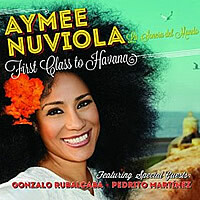 Aymee Nuviola - Also following her LatinGrammy® nomination, "La Sonera del Mundo" Aymee's album First Class to Havana counts with guest artists Amaury Gutiérrez, Alexis Valdés, Gonzalo Rubalcaba y also nominated percussionist Pedrito Martínez. The singer had a banner year after her participation in Sergio George's SALSA GIANTS tour. 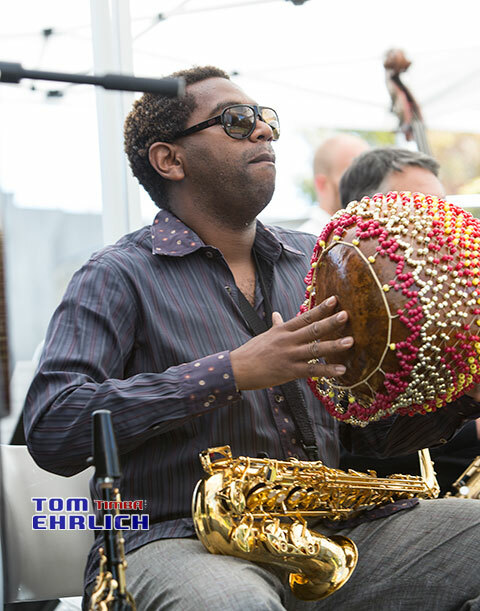 Click on the photo below to visit Tom Ehrlich's photo gallery for Yosvany's performance last year at Yerba Gardens in San Francisco. Click on the photo below to visit Tom Ehrlich's photo gallery for Pedrito Martínez Group's performance last year at Kuumbwa Jazz Center in Santa Cruz. Arturo O’Farrill & The Afro-Latin Jazz Orchestra - Following in his father's footsteps, Arturo O'Farrill scores another nomination for Motema Music (same label as Pedrito Martínez Group;'s album) with his record The Offense Of The Drum. There you have it.... Best of luck to all the nominees! This Sunday, don't miss 3-time 2014 Latin Grammy® Winners GENTE DE ZONA with their full band "Bailando" Tour 2014. November 23rd - Doors open 2pm. 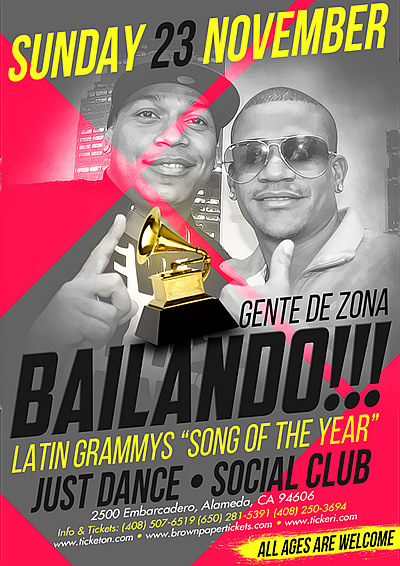 Just Dance (Ballroom) Social Club "Grand Opening"
Este Domingo, no te pierdas a los ganadores de 3 Latin Grammys® 2014 GENTE DE ZONA en concierto con toda su banda completa (12 personas en tarima). Just Dance - Social Club "Grand Opening"